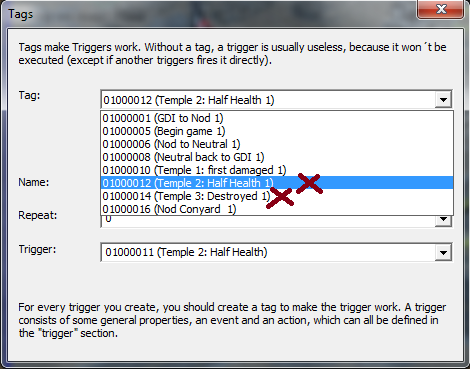 For every trigger you make in Final Sun, a Tag is automatically created. When you assign a celltag or building to a trigger, you assign the TAG, not the trigger. Attaching triggers to triggers simply means using one tag for multiple triggers. Next, go Edit > Tag Editor, and delete all the tags for the triggers you just made, EXCEPT for the one attached to the building/celltag. -If you set "Repeat" to 0, the tag can only fire ONCE. so, whichever one of those triggers fires first will be the ONLY one in the set which fires. This is beneficial in an either/or scenario; For example, in THIS TEST MAP, destroying the Temple means mission failed, capturing it means mission accomplished. 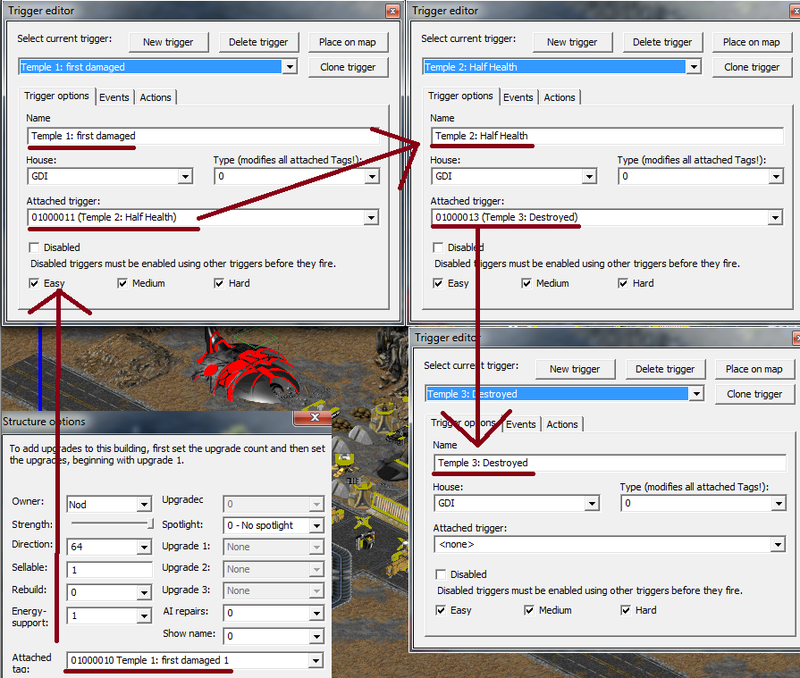 -If you set "Repeat" to 2, then each of your triggers will be able to fire, but remember that they will fire as many times as the Events allow for. You can see an example for yourself in THIS TESP MAP. Different levels of damage fire separate missiles, and you'll notice there are a great deal more missiles than anticipated! This may be mitigated by using Locals to disable each trigger once it is fired. I will not cover that method in depth in this tutorial - if you know how to use Locals, you should know how to do this. However, I might make a separate tutorial on how to use Locals, upon popular request.